Don't forget the Defending Big D/100 Degree Hockey Dallas Stars Watch Party after the game tonight at Buffalo Wild Wings. Details here. On the face of it, things look pretty good for the Lake Erie Monsters coming into the weekend. The Monsters need nine of their remaining twelve points to reasonably clinch a playoff spot. That's a tall order for a team that's at a .543 win percentage on the year. Lake Erie knows what's on the line though, so they will bring everything they've got this weekend. They snapped a six game losing streak with a shootout win over Houston on Thursday. For the rest of the preview though, I wanted to concentrate on how I learned more about Jack Campbell in 30 seconds off the ice on Thursday night than I've learned about him in 240 minutes on the ice. Campbell, if you'll remember, stopped 19 shots in the first and had a 2-1 lead after 40 on Thursday. I asked about whether he prefers to see a lot of shots. Watch his response. Did you catch it? I'm sure you did. It's at the thirty-six second mark. Campbell loses his train of thought and, with a deep sigh, apologizes and explains, "Sorry, it's just really tough to lose." That 'heart-on-your-sleeve' emotion has been missing at times for Texas this season. The obssessive driving impulse to win has been hit or miss. Coach Pyle has harped on it. Sometimes it's one group of guys, the next night it's a different group of guys. That play your heart out, leave it all on the ice style of hockey from all 19 guys for all 60 minutes was hit or miss this season at best. 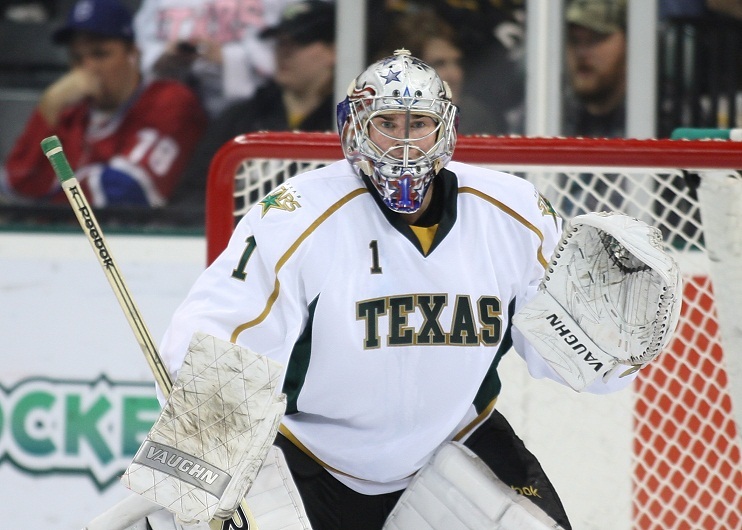 Texas's newest goaltender has been a top player at every level he's been at. He won gold for the USA in the 2010 World Junior Championships and was named 2011 Best Goaltender while carrying the team to a bronze finish. In the body language and voice inflection of that thirty second answer, Texas fans should have learned all they need to know about Campbell for the next 15 days. This kid is hungry to win and will not settle for finishing this (or any) season with a whimper. The first home game for many of the newest Texas Stars started with promise but ended in a 4-2 loss to the visiting Hamilton Bulldogs. Texas opened up a two goal lead through the first half of the game but ceded ground with four against in the back half of the contest. Jack Campbell, who earned the #2 star for the third straight game, stopped 36 of 39 and was the only reason Texas had a lead at any point in the game. "Jack's work ethic is inspiring," said Coach Pyle. "He kept us in this one for sure." ATO signees Austin Smith and Taylor Vause each had a primary assist on the Stars' goals this evening. Travis Morin and Luke Gazdic were the goal scorers. The Stars opened the scoring in the first with a goal by Travis Morin on a two-on-one. Morin looked off Fraser and went shot all the way after accepting a give and go pass from Smith at the blue line. Texas closed the period with a 19-6 shot deficit. Campbell stopped all 19 to retain the 1-0 lead after 20. "We didn't have a best start," said Campbell. "I was happy to get 19 shots. It was a great way to get into the game." The fourth line popped in a goal for Texas in the second as Luke Gazdic and Taylor Vause scored on another two-on-one. Vause chose to pass to a streaking Gazdic, who fired it past Mayer for the 2-0 lead. "Vause does little things well," said Pyle. "That was a big goal from our fourth line." It would be Texas's last goal of the game, however. "With a 2-0 lead, we have to take care of the puck and we don't." Travis Novak started the Dogs' rally with his first of the year at 13:09 of the second. Texas carried their 2-1 lead to the second intermission. The third doomed the Stars as a power play goal from Gabriel Dumont came off a bad bounce in front and tied things up. In the dying minutes of regulation, it was Joonas Nattinen finding twine against Texas with just 76 seconds left. The Stars attempted to mount a comeback but ultimately ceded an empty net goal to seal the loss. 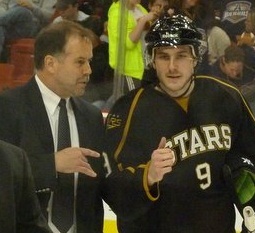 Coach Pyle was encouraged by the play of the new Texas Stars. "They all work hard and bring energy. They need to learn the league, but the only way they'll do that is by getting ice time." Austin Smith is looking more comfortable with the league by the game, as is Taylor Vause. Vause now has a goal, assist and shootout tally in his four games with Texas. Chiasson is getting used to the league, but there were glimmers of what his future potential may be with sagacious plays in the offensive zone and a few blistering shots. Alex Chiasson wore #29 tonight. Drew Schiestel switched over to #22. In a battle between the two worst teams in the conference, tonight's matchup has Texas fans both thinking of the past and yearning for the future. For many fans, games against Hamilton harken back to Summer 2010 when Texas faced off against the Bulldogs in the Calder Cup Playoffs. 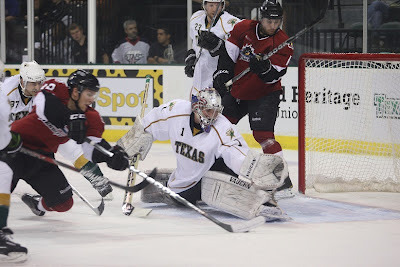 That was a tough series for the Texas Stars, as they trailed 3-2 heading back to Hamilton. 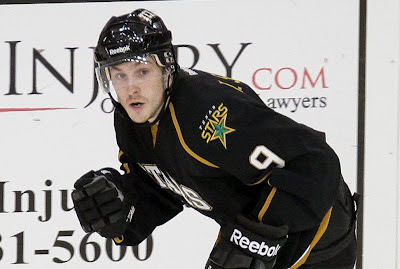 The Stars won both games six and seven in Ontario to face Hershey in the Finals. When you look at the rosters of those two clubs, something stands out: the maturity of the prospect pipeline. Hamilton dressed the likes of David Desharnais, P.K. Subban, Ryan White, Aaron Palushaj, Ryan Russell, JT Wyman, Tom Pyatt, Yannick Weber, Mathieu Darche, and goalie Curtis Sanford. All ten of those players are now playing full-time or have played significant parts of 2011-12 in the NHL. That first season, Texas's roster was bolstered by solid vet signings to make the team successful: Andrew Hutchinson, Dan Jancevski, and Garrett Stafford to name a few. Texas also needed those signings because the cupboard was dry. Hamilton was in a very different place with a fully stocked prospect system, brimming with legit NHLers honing their game and prepping to break into the Canadiens roster. Texas is now looking at being on the precipice of beginning the same type segment in their short life as an AHL franchise. The ATOs that Texas has brought in over the past week are the future of the NHL club. Many more will follow next year including highly touted defensemen Jamie Oleksiak and Patrik Nemeth. By 2015, you will be able to do the same analysis with Texas's 2012-13 roster as we are doing today with Montreal and Hamilton. Meanwhile, Texas will reap the benefits as players who are expected to go to the NHL will be top AHL players as well. That development is the true purpose of the AHL club. On the more traditional gameday note, Hamilton was in San Antonio last night. They lost 3-2. The Bulldogs have struggled on defense to put it mildly, with three players sporting a minus-20 or worse. Expect Jack Campbell in net and winger Alex Chiasson to make his pro debut. * - We can't really count Richard Bachman since he didn't play in a playoff game. To be more pedantic about it, perhaps you can't count Jamie Benn either. We all know Texas fans always count Jamie Benn though, despite what Rockford, Hamilton and Chicago fans say. Two rookies played a big part in the Stars 4-3 shootout win over the Lake Erie Monsters this evening in Cleveland. Jack Campbell stopped 36 of 39 and 5 of 7 in the shootout to win his second pro game. Taylor Vause scored the shootout game winner in the 7th round to seal the extra point. Austin Smith and Colton Sceviour also scored in the shootout. Lake Erie got things started in the first just as a Texas penalty expired when Cameron Gaunce found a rebound of a Brad Malone shot to make it 1-0 after 20. Texas bombed the net in the second period, earning a 17-11 shots advantage in the period. However, the dam didn't break until late when Travis Morin intercepted a Monsters' pass and popped home a SHG on the backhand. Two minutes later, Mike Hedden extended his scoring streak to three games with his 14th of the year off another turnover, generated this time by Francis Wathier. The Monsters would tie it up in the third period on a rebound goal by Greg Mauldin. Francis Wathier stormed back for Texas with an unassisted tally seven minutes in, slapping the puck off Danny Richmond's stick and into the Lake Erie net. Mike Connolly would force overtime for the two teams, tying things at three with just under two minutes left in the game. Texas did not get a shot off in overtime but held on due to the stellar play of Jack Campbell, who stopped all eight he faced. Colton Sceviour, Austin Smith and Taylor Vause all scored in the shootout, which lasted seven rounds. Campbell stopped five of seven and earned second star honors for the second straight night. Vause earned his first star of the game, a first star, for the SO GWG. 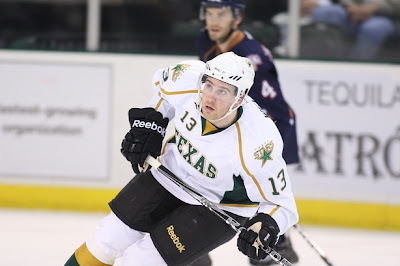 You might have heard about the Texas Stars' (28-33-2-2, 60 pts, #15 Western Conference) new additions over the past week. As the clock winds down on a disappointing season, Texas got a youth infusion over this past week that will make a difference in the next ten games and fans hope will stick around into next year. Jack Campbell is the big name among the three new players. The 2010 draft pick joined the team mid-week and started both games this weekend. It wasn't an easy task as the Stars' faced the #1 and #2 teams in the conference. Campbell collected his first pro win against the #2 Toronto Marlies (Toronto Maple Leafs) on Sunday, carrying a shutout through forty minutes. Campbell made high quality stops with ease and handled the puck frequently in both contests. He is expected to get most of the starts for the rest of the season. Coming in from the collegiate ranks was Austin Smith, the 2007 fifth rounder out of Colgate. Smith immediately joined the Stars' top line with Colton Sceviour and Francis Wathier. Smith had a minus-3 rating with six shots on the weekend. The line generated opportunities, but I am going to hold off judgement until I can see him with my own eyes. Finally, Texas picked up Taylor Vause out of the WHL on an ATO, as I mentioned last week. The centre ice man scored his first pro goal, which he was very proud of, in Sunday's game at Toronto. This week, Texas will add Alex Chiasson out of Boston University. Fans at the Cedar Park Center will have to enjoy his play while they can, as he is slated by many to make the NHL roster next season out of camp. Texas travels to Cleveland for the second of two meetings in the city on Lake Erie this evening. Tonight's game is the only Western Conference action in the AHL tonight, but the outcome has barely any chance of affecting the Western Conference playoff race. Lake Erie sits in 11th by points projections and most teams ahead of them have games in hand. Still, there is a glimmer of hope for the Monsters, so they will be giving it their all. Both teams are featuring newly acquired goaltenders. With the Monsters perhaps on the brink of playoff contention, they are unlikely to start Calvin Pickard, a Colorado draft pick out of the WHL. Texas will likely start Jack Campbell though, who is 1-1 in two pro games. 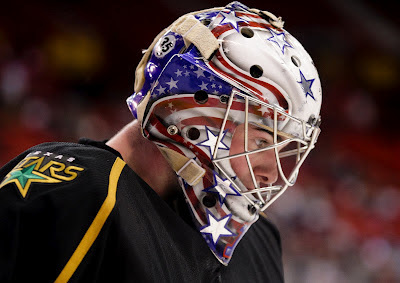 Calvin Pickard, brother of former Milwaukee Admirals tender Chet Pickard, played with Texas defenseman Brenden Dillon for three years with the WHL's Seattle Thunderbirds. Pickard has yet to get into a game for the Monsters, but the #49 overall pick from 2010 is highly touted and should play for at least the next year in Lake Erie as the heir apparent to what was once Patrick Roy's throne. Cedric Desjardins looks to be your likely starter, as he has been over the past five games. In those games, the Monsters are 0-2-1-2. They aren't picking up points rapidly enough to make the playoffs, so things are looking dour. In team history, Texas has only won once at Quicken Loans Arena; that was last year. The Monster will make a return trip to Texas this weekend for their only two games in Cedar Park this season. By that point, it could all be over for their playoff hopes and perhaps Calvin Pickard will get to face blistering point shots from his one-time teammate, Dillon. 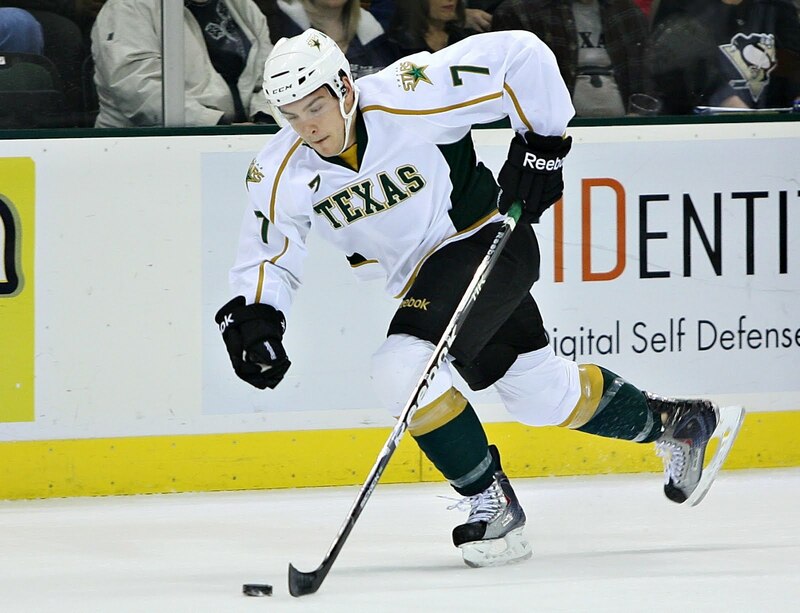 Yesterday, the Dallas Stars announced the signing of college prospect and 2009 draft pick Reilly Smith to an entry level contract with the club. However, Reilly will not be playing with Texas this season; he will immediately go to Dallas. Second rounder from 2009, Alex Chiasson (SHAY-son), who just also finished his college career, will play with Texas this season though. Common perception before yesterday was that Reilly would sign an ATO, like Austin Smith, and come to the Texas Stars. Joe Nieuwendyk, however, believes that Reilly can help the NHL club immediately and is willing to lose a year of his contract because of it. Typically, players on ELCs are allowed ten games before the contract "kicks in" and counts as a year off the contract. This usually happens at the beginning of the season. For example, an NHL club will keep a player who was slated to play in juniors and is on the cusp of the NHL. They can put the training wheels on him for nine games and see how he does. However, once he plays that tenth game, the contract "begins" and cannot slide another year. However, a player who is 20 or older when he signs can't benefit from a "slide". The contract expires when it expires. Because Reilly was 20 when he signed his ELC, he can't "slide" a year. That is good for Reilly and bad for Dallas, as the Stars will now only have his services at the low ELC price for two years instead of three. Nieuwendyk must be very confident in his game helping Dallas for this to happen. If he hadn't been so confident, he would have likely directed Texas to sign him to an ATO (a la Taylor Vause) with the expectation that he would sign an ELC over the summer. Alex Chiasson, however, will be coming to the Texas Stars this week. He should be in the lineup in time for the homestand this weekend. Chiasson is a big bodied winger out of Boston University. Dallas has confidence in his game as well; many place him on the NHL roster to start next season. Chiasson is best off starting his career now as well and getting away from the toxic Boston University hockey program. It is clear that Texas is willing to give these ATOs a shot. Smith plays now with Sceviour and Wathier, bumping Glennie to a line with Morin and Fraser. I expect Chiasson will force some hard decisions in the lineup, because Dallas will definitely want to see him in a top six role. Will Texas Welcome Another Smith This Week? Texas could be seeing the addition of yet another Smith to its roster in the coming days. Last night, Reilly Smith's Miami RedHawks fell to the UMass Lowell Riverhawks in overtime in the NCAA college hockey tournament. The RedHawks, down by three to start the third, fought back to make it to OT but fell 4-3 in extra time. Reilly Smith, a junior, was Dallas's 3rd round pick (#69 overall) in the 2009 draft. Other 2009 Dallas draftees include Scott Glennie, Alex Chiasson, Tomas Vincour and Curtis McKenzie. It is widely postulated that Reilly could turn pro next year and an ATO in Texas would be the way to start that career off. The only hangup is his collegiate status. Reilly is a junior. Like football players, hockey players can leave college early to play in the pros. However, that decision is a hard one to make, just as in football. For an example of another player who left early, Texas only has to look at Richard Bachman, who left Colorado College after his sophomore year to turn pro. Director of Player Development Les Jackson told DallasStars.com in February: "We'll have discussions with him and assess at the end of the year where we're at. But that's something we'll have to work out. He looks like he's close to taking the next step. We'll just have to discuss that with him and his family and see what the next step will be." Now it's the end of the year. I'm sure those conversations Jackson mentions will begin over the next few days with Reilly. Much like Austin Smith, expect Reilly to sign an ATO in Texas but then also sign his ELC with Dallas. Of course, that's all dependent on him deciding in the next three weeks to go pro. The decision could even be something he pushes off until the summer. Regardless of the outcome of tonight's game, starting Jack Campbell sent a message to the Texas Stars that the future is now. GM Joe Nieuwendyk is looking to shake up Texas next year. That started tonight at the Cox Convention Center. Despite the 3-1 loss, Jack Campbell stopped 32 of 35 against and made several high quality saves among the routine ones. Austin Smith had three shots on net and a minus-2 rating. One of those goals against came on a turnover by the rookie in his first game. Mike Hedden picked up the lone Stars goal in the contest. Campbell stopped 13 straight shots early but beat for his first pro goal against by a screened point shot from Kevin Montgomery 13:56 into the game. The Stars were outshot 15-5 in the first period but were only down 1-0 after twenty. The Barons added two more in the second period. After an early surge by Texas, outshooting the Barons 11-4 early in the middle frame, OKC was the first to score in the period. Anton Lander got his first AHL goal on the fifth shot of the period for OKC, tipping a Colton Teubert point shot into the net. Texas got one back quickly though as Mike Hedden's unassisted tally, his 12th of the year cut the lead to 2-1. Just seconds later, an Austin Smith turnover put the puck on the stick of Tyler Pitlick, who passed to Mark Arcobello for a 3-1 lead. Texas would bomb 20 shots on Yann Danis in the period to OKC's 13. 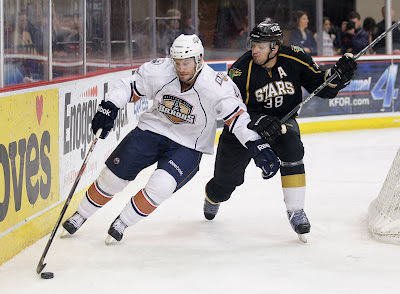 The Stars and Barons would skate to a scoreless third with Texas outshooting OKC 10-7. The Stars would go 0/5 on the power play tonight, including an extended 5-on-3 in the second, as the Barons shut down one of their most effective scoring avenues. 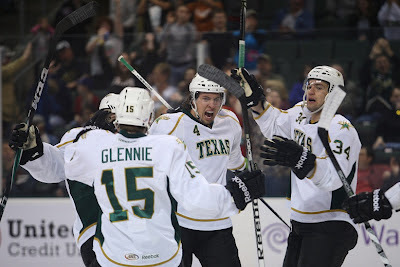 With playoffs clearly out of reach for the Texas Stars, what is the rest of the season about for them? As previously discussed, it's about the future. The future is now in terms of talent. Texas gained three ATOs this week, two of them Texas draftees. All three could be in the lineup on Friday night. It is easy to say that Austin Smith will join Taylor Vause among the forward ranks this evening. 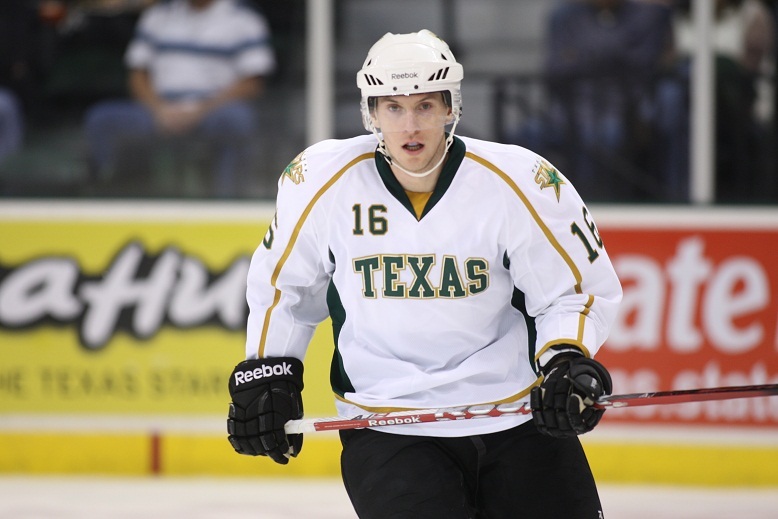 Austin will wear number nine, as he did in college, in honor of his favorite player, Mike Modano. What isn't clear is whether Jack Campbell will join them. Campbell has tweeted that tonight's game is a "big game" and he "can't wait". That could just mean that it's his first game with a pro team and it's a big one for him any way you cut it. However, it could also mean that he's getting the start. Personally, I would not start Campbell in either game this weekend. The earliest I would consider it would be Lake Erie. I think you give him a few games to be in the trenches with the team and ride the pine. From there, why not start him as much as you can? On the other hand, what is there left to lose? Campbell allowed nine goals in his last OHL game and still won. It's not like he isn't used to goals against. However, there is something to be said for the emotional/mental side of goaltending. We've seen it a lot this season in the body language of Raycroft and Beskorowany. Get down early and you can, if you aren't in the right frame of mind, see that affect your overall game. Dallas wants to make sure that they do not get into any sort of situation where they hurt Campbell's development by having sent him down into the end of a losing season. Starts are surely what they want, but do they want him to be positively carpet bombed by the best in the league or ease him into it? That remains to be seen tonight. Just to make it official, Texas has announced three roster moves in the past two days that haven't been posted here yet. First, goalie Jack Campbell, Dallas's 2010 first round selection, was assigned on Tuesday. He arrived yesterday and practiced with the team this morning. Second, Austin Smith, one of Dallas's 2007 5th round picks, arrived yesterday as well and presumably practiced this morning. (Other 2007 5th rounders include Jamie Benn, Ondrej Roman and Michael Neal. Talk about a wide spread.) He spent today doing radio interviews with Jack. None of those were publicized by the Stars though, so I did not hear them if they occurred live. Finally, Texas returned Scott Campbell to Las Vegas now that Taylor Vause and Austin Smith are in the lineup at forward. "If [the new signees are] going to work hard, they'll play as much as we can possibly play them. Obviously the guys [here] right now aren't getting it done, so we'll take a look at the new guys as much as possible." Last week in this space, we talked about some franchise records that had fallen this season for the Texas Stars (27-33-2-2, 58 pts, #15 Western Conference). This week, we are also talking about a franchise record broken, consecutive games lost. With their fifth straight, Texas broke that record on Monday night. Texas has been plagued by bad defensive zone coverage and endemic lack of finish in the offensive zone. "Everybody needs to [step up]," said Coach Pyle. "We give up too many easy goals and situations where you have a way to win and find a way to lose." For Dallas fans, the big story is amateur tryout contracts. Jack Campbell should join Texas today and Austin Smith as late as Wednesday. Taylor Vause, a signing out of the WHL, played in his first pro game on Monday night and could sign an ELC with Dallas for next season. As to the ice time for the ATOs: "If they're going to work hard, they'll play as much as we can possibly play them. Obviously the guys [here] right now aren't getting it done, so we'll take a look at the new guys as much as possible." Pyle added, "Campbell will definitely be getting starts." "We don't deserve the playoffs. I've said from day one: we're riverboat gamblers. You win by the sword; you die by the sword. We deserve what we've got. We've earned the position we're in, even with injuries and callups we've had chances to win. We put ourselves in a position to win and then we don't follow through because we don't have guys committed to the team." 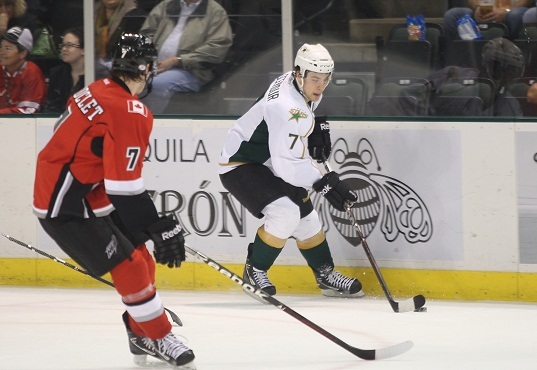 The Texas Stars set an unfortunate franchise record this evening with a loss to the Abbotsford Heat. The club has now lost five straight games, their previous record being four. "We're going to start working harder in practice," said Coach Pyle. "If we're not working hard enough in games, we'll do it in practice." Texas got an early lead, but lost it in the second and never regained their footing. "We're so fragile at times," said Coach Pyle. "We struggle in our D zone and we're not handling the pressure really well." Colton Sceviour had both of Texas's goals on the night, his 18th and 19th of the year. His penalty shot in the first, which he scored on, was Texas' first penalty shot of the year. Texas drew first blood on a penalty shot late in the first. Colton Sceviour was hooked on a breakaway by Chris Breen. Sceviour pulled out his signature move for the penalty shot, backhand shelf. "I don't think I'd had a shot against him since junior," said Sceviour. "I just went with that move since it's worked so well." The Stars would carry the one goal lead to the intermission. Abbotsford evened things up and jumped ahead a bit in the second. Brian Connelly bombed a shot from the point that deflected off Dustin Sylvester just left of the net for the tie. Beskorowany had no chance on the shot, coming just 54 seconds into the middle frame. The Heat would go ahead 2-1 just four minutes later as Ryan Howse scored, streaking down the right wing side and popping one past Beskorowany on the power play. The Heat would add to that lead just eight minutes later as Adam Estoclet ripped one from the nearly the same spot in the right wing circle and found twine on the far side for a 3-1 lead. With time winding down, Colton Sceviour potted his second of the night on a scramble in front, popping his goal in from right on the goal line. Linemates Wathier and Glennie assisted on the play, which brought it to a 3-2 deficit for Texas after forty minutes. The third period was all Abbotsford though as Ryan Howse added his second of the game with a backhander off a mess in front of Tyler Beskorowany. "The goals we give up are so easy," said Coach Pyle. Andy Brandt popped in his first AHL goal to rub a little salt in the wound with seven minutes left. The forward was just in the right spot in the slot to receive a pass with traffic in front and laser one back Beskorowany. The WHL scouts for the Dallas Stars have been busy these past few seasons. After picking up Jamie Benn in the fifth round in 2007, Dallas got Matt Fraser and Brenden Dillon as undrafted free agents last year. This year, it's Taylor Vause of the Swift Current Broncos. Vause was the team captain for the Broncos, collecting a team high 37 goals, 46 assists and 83 total points. He led in power play goals as well at 15. Another part of the signing that I really like is Vause's interests in areas other than hockey. For example, he designed his team's pink in the rink and St Patrick's Day other charity jerseys, which you can learn more about in this article from icethetics. Also, Taylor is on Twitter at @WizardofVause (giving you a hint on how to pronounce that name). That links to his hilarious collection of photoshops of various NHL players onto movie posters. The kid's got talent and he's funny? Leader and a goal scorer? Love the signing. 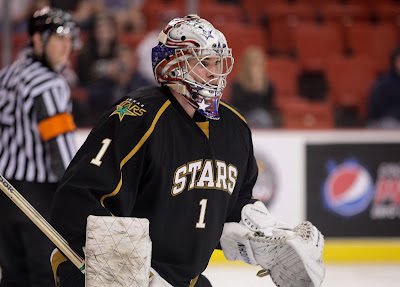 The Texas Stars announced on Monday that center Taylor Vause (pronounced - VOSS) has been signed to an ATO (amateur tryout agreement). Vause turns pro after completing a five-year campaign with the Swift Current Broncos of the WHL. The Calgary, Alberta native led the team in scoring, posting career highs in goals (37), assists (46) and points (83). The 20-year-old also led the team with 15 power-play goals. Over the course of his WHL tenure, Vause scored 79 goals and assisted on 110 others for 189 points in 273 games. Big news out of Dallas today is that goalie Jack Campbell (2010, 1st round) has been assigned to the Texas Stars. Campbell is not likely to dress tonight for Texas but will start practicing with the team this week and could be getting starts as early as next week, in my mind. Just for his own sake, I would not start Campbell against OKC or TOR this weekend, and I would probably hold off until the next home game for his next start. That would be Hamilton on Thursday the 29th. Austin Smith (2007, 5th round), leading scorer in the NCAA this season, also told Mike Heika this morning that he could sign his contract as early as today. A forward would be a much quicker addition to the lineup. He could play as early as Friday. In the only game on the AHL schedule tonight, the Texas Stars close out their season series with the Abbotsford Heat this evening in Cedar Park. The Heat are not flying quite as high as they were earlier in the season in the standings, but they are setup for a playoff run in the six spot. Despite their playoff positioning, the Heat are on a downward trend. They have lost six of their last eight games, starting with their 4-1 loss to Texas in Abbotsford on March 4th. Texas, however, is on a four game losing streak, all at home. According to my playoff predictions sheet, while the Stars have not been mathematically eliminated from the playoffs yet, they were realistically eliminated with Saturday's loss to the Barons. What is Texas playing for now? It takes a lot to get yourself up for a game after the playoffs are no longer a possibility. The Stars are playing for pride at this point. They should be playing to have something to build on for next year. They should be giddy about a chance to play spoiler for teams like San Antonio, Lake Erie, Peoria and tonight's opponent, Abbotsford. Texas is 2-4-0-1 against Abbotsford this season, their only home win coming on January 11th in the final seconds of the game. Jon Rheault and Krys Kolanos lead the way for the Heat against Texas with 3-4-7 and 2-4-6, respectively. Texas forwards Sceviour and Schultz (out of the lineup) lead in goals against Abbotsford with three each. Travis Morin has five helpers against the Heat. Also notable, Angelo Esposito has 1-2-3 in just two games against Abby this season. In net, Danny Taylor has yet to lose to the Stars this year with a 3-0 record. Among in residence goalies, Leland Irving is the only one with a loss against Texas on his record. In transaction news, Texas sent Nick Layton back to Allen yesterday. This likely means that Mathieu Tousignant is ready to go again. Additionally, Texas will be getting more bodies this week with ATOs on the way. Tonight, the Oklahoma City Barons showed Texas why they are a favorite for the Calder Cup this year. "They've got four good lines and got goals from their third and fourth lines tonight, which is huge," said Coach Pyle. The Stars once again got behind early, which has been typical this season. "We got behind tonight again and we had chances to get back into it." The power play, despite going 2/7 on the night, didn't score at the right times. Texas went 0/5 on the power play in the first and second and trailed 4-1 by the time they collected their first PPG. 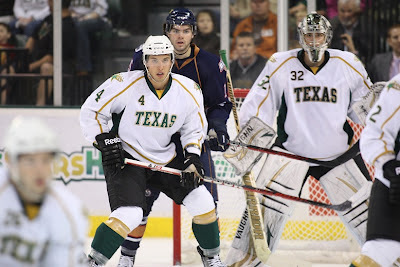 "We were getting chances, but they weren't finding their ways through," said Stars center Travis Morin. "You can move it around the outside and look good, but you have to get people in front of the net." Tanner House got things started for OKC early in the first period with his fifth of the year. The rebound goal off the initial shot from Ryan Martindale came 3:25 into the game. Shawn Weller answered right back for the Stars. Texas had the Barons out of sorts in their own zone, and Weller scored with a spin-o-rama backhand move in front of the net. Morin and Schiestel assisted on the play, which came just 76 seconds after the Barons' goal. Thigns calmed down a bit from there until halfway through the period when Philippe Cornet broke through the Texas blue line, wearing two defensemen like a coat and scoring his 23rd of the year to make it 2-1 OKC. Hunter Tremblay scored two minutes later as the Stars' ineffective power play allowed a short-handed goal. The shorty was Texas's eighth shorthanded goal against on the season. The two-on-one distracted the defenseman, Spang, as Tremblay went shot all the way for his 14th of the year. "The shorthanded goal killed us," said Pyle. "The start [overall] kills us." To start the third, David LeNeveu made a few spectacular saves in the Barons zone and, as it often does, that led to a good chance at the other end. Dylan Yeo wired one from the left wing circle for a 4-1 Oklahoma City lead. Texas's power play finally caught on in the third period, but it was too late. Colton Sceviour scored his 17th of the year, with assists from Wathier and Lukowich, at 6:34. With the 6-on-4 advantage late in the game, Francis Wathier ripped one glove side high on LeNeveu to make it 4-3 OKC. Schiestel and Lukowich started on defense but then switched the paitings listed above. With the game against the team same team as last night, there isn't too much to preview. I wanted to show Coach Pyle's entire postgame interview from last night, because I think it was really quality stuff and says a lot about how this team has done this season. The Stars came out to a two goal lead in the first and led after the second 3-2 but ultimately fell 4-3 in regulation. The loss marked their first regulation loss when leading after two on the season. Brenden Dillon picked up a goal and an assist and Matt Fraser added his 30th of the year as Texas fell 27-31-2-2 on the season. "We don't deserve the playoffs," said Coach Pyle. "I've said from day one: we're riverboat gamblers. You win by the sword; you die by the sword. We deserve what we've got. We've earned the position we're in, even with injuries and callups we've had chances to win. We put ourselves in a position to win and then we don't follow through because we don't have guys committed to the team." Texas got the scoring off to a quick start in the first period. Brenden Dillon bombed a shot from the point that bounced off the glass behind Danis and rebounded off the goalie's skate to make it 1-0. Travis Morin assisted on the play. Exactly twelve minutes later, Mike Hedden picked up his 11th of the year thanks to a defensive misplay by OKC's giant, Kirill Tulupov. The big man missed the puck with Hedden hard on the forecheck and the Texas forward made no mistake, finding twine behind Danis for the 2-0 lead. Tyler Beskorowany kept up his part of the deal in first as well with great glove work to kill the play when needed. OKC got their first in the middle frame in much the same way. A misplay by Travis Morin gave forechecker Ryan Keller a clear path to the net, where he beat Beskorowany to cut the lead in half. "That can't happen," said Pyle. "It's kind of embarrassing. Our leaders have to take care of the puck"
Four minutes later, Texas was out of sorts with two straight minors against them. They killed the first but allowed a PPG in the second. As Texas was distracted by a clear they though was offsides, Bryan Helmer zinged the puck to the net from the point to tie things at two all. With time ticking down in the second period, Matt Fraser found himself breaking out on a 2-on-1 from the neutral zone. It was no surprise when the rookie chose to shoot and scored his 30th of the year to make it 3-2 Texas. Texas went to the third period with a lead, a situation in which they had never failed to collect a point this season. The Stars allowed the game tying tie early in the third though as Taylor Chorney popped one past Beskorowany with Mike Hedden still on the ice on the halfwall after an uncalled trip. 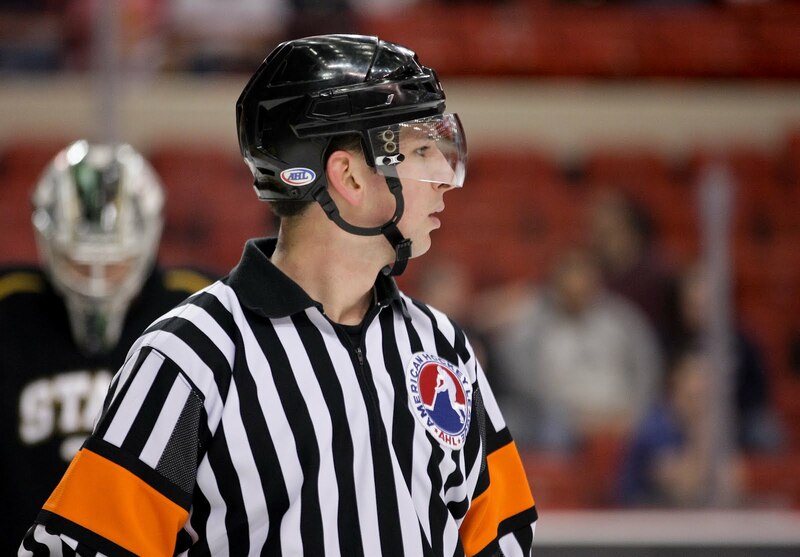 Of the penalty calling, Pyle added, "It doesn't matter what they call. You've got to adapt to it." The Stars killed a two minute long 5-on-3, which whipped the crowd into a fury, and even earned a 58 seconds two man advantage of their own. Neither team would score on their power play. The game winner came when OKC broke into the zone and all the Stars skaters collapsed on the skater with the puck. An uncovered Mark Arcobello received a pass out of the fracas and potted his 13th of the year into the practically empty net for the 4-3 win. Despite only having a month left in the season, Texas still has just under half of their season series with the Oklahoma City Barons ahead of them. Texas will play OKC twice this weekend, next week in Oklahoma and in the last home game of the season on April 14th. Texas is 2-4-0-0 in the series, which is surprising given the Barons' mastery of the league this season. The Oklahoma City Barons are a perfect example of the adage that you don't win the Cup in October, but you certainly can lose it. They've ended up on the right side of that equation though as a strong early season is helping to keep them afloat and in the first slot no less despite recent struggles. In the last 10 games, the Barons are 4-3-2-1. They have failed to put together back-to-back wins since February 9-11 and haven't gone on a three game streak since ending their seven game streak on February 3rd. Some of that can be chalked up to the absence of Yann Danis, who is one of the best goalies in the league this season and spent a good chunk of time with Edmonton these past few weeks. David LeNeveu is not a bad goaltender by any means; Danis is just a hair better. Danis, however, is day-to-day with a sore knee. Olivier Roy joins them from Stockton of the ECHL to backup LeNeveu. "You can blame goaltending, which indeed has come down to earth. You could blame the loss of Ryan O’Marra and the head-scratching induction of Bryan Rodney. Perhaps it’s the line shakeups that occur when the Oilers infuse the Barons with “NHL caliber players”. Maybe it’s coaching. Maybe it’s fatigue. Maybe it’s a team that is due for a dip, and dip you dip we dip is occuring. I have reason to believe that this Barons team plays with too much pride, too much determination, and too much grit to let a slump continue. But one has to wonder, why now? Why here? Why March?" More on that front at his blog. Calder Cup winner Ryan Keller leads the way on offense with 18-26-44 and #4 scorer Teemu Hartikainen is out this weekend, up with the NHL's Edmonton Oilers. Texas has three skaters at five points against the Barons this season: Fraser (3-2-5), Wathier (2-3-5) and Spang (1-4-5). Tyler Beskorowany is the only active goalie with a win over the Barons this season. In the Stars's last two games, Matt Fraser set and extended his hold on the franchise scoring record. Fraser is on a three game goal streak coming into tonight's game. NHL GMs are meeting in Boca Raton, Florida, this week to discuss the things that GMs discuss, among them potential rules changes to the great game of hockey. Among the rules changes considered for the future could be the addition of what is being called a "ringette" line. Many GMs want to see it tested at the AHL level before they send it to the NHL, and that's nothing new for the American League. The line comes from the game of ringette. It would run across the tops of the face-off circles. When coming out of the defensive zone, teams would have to advance the puck to the line before they could pass it to the far blue line. It's a compromise between leaving the game as it is and re-instituting the red line to outlaw two-line passes. In theory, it would still allow for a stretch pass, but it would keep teams from firing the puck from deep in their end to the far blue line and simply tipping it to avoid icing. The AHL has a history of testing out new and different rules for the NHL. The year of the NHL lockout (2004-05) was a big one for the AHL. The league had a record gate of 7.1 million fans as NHL stars and fans alike went to the league for their dose of hockey. Several rule changes were tried that year that made it to the NHL. Two of the big ones include the mobile goalie stifling "trapezoid" and the shootout to decide a winner after OT. Additionally, the league implemented wider blue lines, presumably to make it easier to keep the puck in at the point, and tag-up offsides. All of those items made it to the NHL after the 2005 CBA. One of the more bizarre rules changes that the AHL tried out for the NHL that year was the institution of one-minute penalties in OT instead of two minutes. Obviously that one went over like a lead balloon as it never made it to the NHL level. Another, which is still a point of contention, was the adoption of no-touch icing. The NHL is currently looking at adopting what they are calling hybrid icing as a compromise to this. The NHL decided not to implement no-touch and the AHL reverted to touch icing as well in 05-06. For the record, many other leagues use no-touch including the ECHL, CHL, IIHF international competition, European leagues and almost all amateur league. Since the AHL adopted the last few rules necessary to align themselves with the NHL rulebook in the early 2000s (delay of game for puck over the ice was one of the last sticking points), the NHL has used the AHL for rules development as well as player, coach, and official development. It is a positive relationship that the league could be continuing this coming year with the "ringette" line. The return trip to the Cedar Park Center for the Grand Rapids Griffins went just their way, as they got revenge over the Stars for their OT loss a week ago with a 5-2 regulation win tonight. Texas got down early, allowing two goals in the first five minutes, and never really recovered in the game. "You either have bounces with you all game or you don't, and we obviously didn't," said Colton Sceviour. Team commitment to defense was a big issue in the game as Texas allowed numerous odd-man rushes. Tyler Beskorowany deserves credit for the score not being 10-2 given the "sloppy" play in front of him. "I'd just like us to take a step forward and take care of the puck better," said Coach Pyle. "We need a commitment there and we don't have it." "Even though we're shorthanded, it doesn't matter. You have to find ways to make it work," said Pyle. "If you're missing offensive guys in your lineup, you have to play better defensively." Former Stars Fabian Brunnstrom and Chris Conner scored 28 seconds apart to start the Griffins' good night three minutes into the game. Texas answered back with Brenden Dillon's fourth of the year just 30 seconds later. It came as he snuck down from the point to bang home a rebounded puck from the slot. Grand Rapids would score again in the 12th minute of the game with Tomas Tatar scoring on a bit of an off-speeder that change directions on its way in from the point to beat Beskorowany. Matt Fraser scored his 29th of the year halfway through the second period, finding a loose puck in the blue paint off a Jace Coyle slapshot. The lead was cut to one and Texas found itself on a 5-on-3 power play thanks to penalties to Conner and Raedeke. Texas would fail to convert, however, ultimately going 0/6 on the power play on the evening. "We had opportunities but we just missed them," said Pyle. With the momentum seemingly in their favor, Texas allowed Grand Rapids' fourth of the game 16 minutes into the second. "We tighten it up a little bit but then we shoot ourselves in the foot," Pyle added. Brunnstrom's second of the night and tenth of the year came on the power play and set the score at 4-2. Grand Rapids added another in the third on a 5-on-3 power play after a double minor for high sticking to Dan Spang and a roughing minor to Luke Gazdic in the final five minutes. Angelo Esposito has a stiff knee, according to Coach Pyle. He was given the game off. Despite a week with two wins, the Texas Stars (27-29-2-2, 58 pts, #15 Western Conference) are close to sealing their fate as the first edition of the AHL club not to make the playoffs. Needing 28 points to match the current 8th seed's pace, Texas would need a 14-2-0 record from here on out to make the postseason. While that may be a dire outlook, there are positives to be found among the bigger picture of not making the playoffs. This week's games saw several records set and continued for Texas Stars players. In Saturday's game, Matt Fraser broke the record for goals in a single season, previous set by Aaron Gagnon in 2009-10. Fraser's 28th of the year came shorthanded. He is also tied for the single season record for PPGs at ten. After an early season cold streak, Colton Sceviour has exploded in the second half. Since December 27th, he has tallied a point in 16 straight home games. He has 33 points overall home and away since Christmas. It is by far the top record in the AHL and for the franchise for such a streak. He's clutch to boot with six game-winners. Finally, Travis Morin shattered the single season assists record in early February. The record, previously held by Perttu Lindgren at 33, is now at 41 and grows with each helper from Morin's stick. After what happened to the Griffins last week in the Cedar Park Center, anyone who thinks they don't come into the Stars' barn with a chip on their shoulder is mad. The Griffins stormed back from a 4-0 deficit in the third period only to lose in overtime. 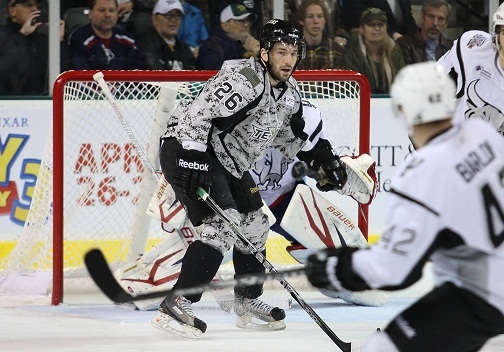 They split their weekend series with Houston and are now back for a second serving of Texas Stars. While it looks like neither of these teams will be making the playoffs at the current juncture, they are both making positive strides for their future development. Each team has six wins in their last ten games. However, both are beset with early season difficulties that doomed their playoff hopes. As they say, you don't win the Cup in November, but you can sure lose it. Lineup changes for Grand Rapids include the addition of Jordan Pearce, fresh off a short stint with the Red Wings. Tom McCollum looks to be the odd man out now for the Griffins. In other assignment news, former Dallas farmhand Chris Conner has four points in three games since assignment last week. Texas's lineup will also look a bit different tonight. With the callup of Jordie Benn, Matt Case should slide in on defense. 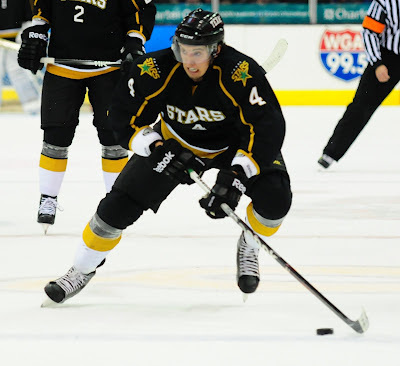 Additionally, as the Stars called up Nick Layton, he could swap spots with Scott Campbell on the fourth line. Tonight's game will be the last home meeting between the two teams on the season. The Stars visit Grand Rapids on April 4th. Fresh off his hiring as head coach of the Texas Stars, Jeff Pyle was busy on the ice in training camp last September, trying to acclimate himself to the Stars’ systems and players alike. During a break, one of the forwards skated up to him, “My dad wanted me to say hello.” Pyle paused for a second, racking his brain, then the last name clicked: Sceviour. “I was thinking, ‘How old do I feel right now?’,” said Pyle. The reason why the name clicked was a lost connection from over twenty years ago when Pyle spent three seasons between the IHL and Europe playing with Darin Sceviour, father of current Stars forward Colton. Coach Pyle and Darin Sceviour first played together with the Saginaw Generals of the IHL. The Generals advanced to the second round of the 1987 playoffs but fell to the Muskegon Lumberjacks. Pyle co-led the league in points that year with 136. The glitter of a bigger paycheck in Europe was a gilded promise for the two, as the club was in dire straits. Pyle was a joker though, always trying to make the best of a bad situation, while Darin was more straight-laced. The team was having trouble gelling as a group, since most of the players worked during the day. Darin and Pyle were two of the only players available for daytime practices. Instead the coaches tried to force togetherness, often with group stretching or running before games to warmup. After just fourteen games, Pyle, a left winger, was playing defense most nights because the defense was "brutal". He ended up leaving midseason while Darin stayed on and became the leading scorer for the club. The two didn’t play together for the rest of their playing careers, though they stayed in the same division, 2-Bundesliga. Darin left Europe in 1991 and is now a building inspector in Alberta but also scouts for the Lethbridge Hurricanes, Colton’s junior team. He coached both Colton and his younger brother, Logan, all through their youth. After that initial exchange on the ice in Dallas, Colton gave Coach Pyle his dad’s number and the two reconnected after a game while Darin was in Austin in October. Colton wouldn’t mind the extra praise though, as he and his dad have been in constant jocular competition comparing their hockey careers. Darin got into one game with the Chicago Blackhawks, and Colton is also at one game (at Flyers on February 5th 2011). The Rampage took tonight's contest over the Stars by scoring a power play goal in the final ten seconds of regulation to win 4-3. Tonight's win was just their fourth all-time in Cedar Park. After allowing the first two goals, Texas fought back from a 3-2 deficit to tie things in the third period. "We played pretty hard and waited for opportunities to tie it up," said Coach Pyle. With 6.5 seconds left, and on the power play, San Antonio found the back of the net to win it 4-3. "That's a bad bounce," said forward Luke Gazdic. "We were working hard, but we could have cleaned that up a little bit." Andrew Raycroft started the game for Texas but Tyler Beskorowany finished it due to an injury to Raycroft suffered in the first. No indication on a timetable for the injury. San Antonio opened the scoring in this one again tonight. Jon Matsumoto tipped a harmless looking Evan Barlow shot on a drive to the net to bewilder Raycroft and break the scoreless tie 13 minutes in. Just two minutes later, a 3-on-2 would generate the Rampage's second of the night. "Our forwards have to do a better job defensively," said Pyle. "The goals we gave up were too easy." Tyler Beskorowany started the second and the team responded, generating chances and eventually the team's first goal on a mad scramble in front of Dov Grumet-Morris. Esposito scored his 6th of the year on the play, assisted by Gazdic and Drew Schiestel. Schiestel's assist was his third in as many games with the Stars. The Rampage earned a 3-1 lead just a minute later though as Bill Thomas charged down the slot to finish off a puck sitting idle off a scramble in front of Tyler Beskorowany. The goal was Thomas's 20th of the season. Matt Fraser would do him one better just two minutes later as the young forward broke the franchise record for goals in a single season with his 28th, a shorthanded tally no less. Texas would end the second in the same spot as last night, down one. The Stars came back in the third to tie things thanks to a cram play from Francis Wathier that creeped over the goal line. Colton Scveiour's assist on the goal extended his home point streak to sixteen games. With OT looming, Stars captain Brad Lukowich took a penalty for interference on a breaking James Wright. It was a tough call, given the precedent set through the night for minors, but it was a by the book call. "With two minutes left, the puck has to stay deep," said Pyle. "We can't put pressure on the D like that. The call was what it was." With 6.5 left, it was San Antonio's Michael Repik with his 11th of the year, a bouncing broken play that ended up on his stick and then into Texas's net. 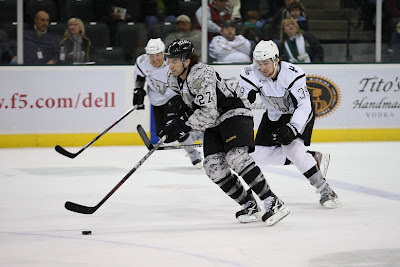 The Stars called a timeout, but a faceoff win by San Antonio ended the game at 4-3 for the Rampage. Texas pointed to the mental side of the game for the loss in this one. "You've got to play smarter and we haven't been able to grasp that at times," said Pyle. Meanwhile, Gazdic added, "It's basically who makes the first mistake. It's really cliche, but it's whoever works harder and capitalizes on mistakes." Texas and San Antonio line up again for another installment of the I-35 Rivalry. Last night's tilt went to OT, a common theme between the two clubs, and San Antonio fell in the extra session for the 7th time in team history in the CPC. The Stars are looking for more of the same tonight in terms of a tight game. "One goal games we seem to have more confidence, not getting caught up in the score," said Colton Sceviour, who scored last night's GWG in OT. I would expect Tyler Beskorowany to go tonight against Dov Grumet-Morris for the Rampage. Texas looks to limit chances and blown coverages that hurt them in last night's game. "We need to limit some of those offensive chances that we allowed today, play a tight tight game." In the end though, it is a rivalry. There is no love lost between the two teams and that should be evident on the ice once again this evening. "If you get a chance to line someone up and hit them clean, you're going to take it." Colton Sceviour scored his 16th of the year in overtime to push Texas past San Antonio and extend his personal home point streak to fifteen games this evening. Texas was down 3-2 heading into the third period but rallied to tie thanks to Matt Fraser's team-leading 27th of the season. "A comeback win against that team in the third period is a good win," said Coach Pyle. "We've always fought back. This team has no quit in it. We're going to play to the final whistle of the final game." Neither team led by more than a goal at any point as the two clubs played a tight game throughout, as is to be expected from two teams that know each other so well. "With a team like San Antonio, we play them so much that it's like a chess match," said Sceviour postgame. "I could go over there and play their system and they could play ours no problem. We see each other that much." Former Star Greg Rallo got things started early in the first, being left completely open on the backdoor and potting his 17th of the season for the 1-0 lead. "The first one bounced crazy and ended up with the wrong guy," said Pyle. "Bottom line, it was a bad break." The Stars answered in the second period with a Dan Spang point shot that found twine from the blue line and tied things at one all. Texas blew defensive coverage a few minutes later as no one picked up Bill Thomas on a rush into the Stars zone and he lasered one past Raycroft for a 2-1 lead. Mike Hedden answered back under a minute later with a puck shot from the left wing goal line that ticked off Markstrom's right shoulder and into the net. San Antonio would exit the third with a 3-2 lead though as James Wright polished off a pass from Rallo. Texas picked it up in the third, outshooting the opposition 9-3 and, more importantly, outscoring them as well. "In the third we played really well and got back in it," said Pyle. 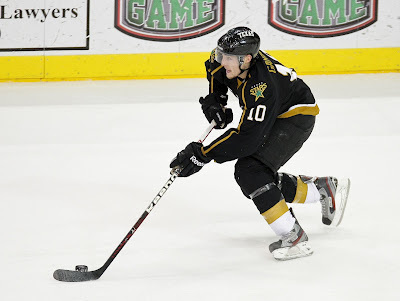 Matt Fraser scored his 27th of the season and 8th against the Rampage for the three all tie. Texas got a few chances at the power play late in the third, but could not convert and went to OT with the Rampage, a very common occurrence between the two at the CPC. In the end, it was Drew Schiestel who was an overtime hero again. Using the time and space that San Antonio gave him to wait out a play and generate the game winner. "It felt like I stood in front of the net for two minutes, but it was just ten seconds," said Sceviour of Schiestel. "He kept waiting and waiting." When he finally fired the puck on net, Sceviour finished off the play to set Texas at a 4-3 margin of victory over their neighbors to the south. Andrew Raycroft finished the game with 25 saves on 28 shots. Expect more of the same tomorrow night as these two teams battle again. Mathieu Tousignant is out "for a while" with an injury, according to Coach Pyle. The Texas Stars welcome frequent visitors in the San Antonio Rampage to the Cedar Park Center tonight for the second game of their seven game home stand. Among all teams they play at home, San Antonio is one Texas has to love seeing on the schedule. While there is no love lost between the two, the Rampage have emerged with two points only three times in the three years the two have been playing in Cedar Park (3-5-6-1). Last visit, the Rampage arrived just an hour before puck drop thanks to traffic on I-35 and never really recovered as a club, falling in both games. Those games could have kicked off a rejuvenation for the Stars, but they dropped three of their next four instead. Despite San Antonio being the playoff club, Texas has superior special teams play on both sides of the ledger. The Stars overall power play clocks in at 21.3% to SA's 14.9% and penalty kill at 82% to SA's 80%. "We have to stay out of the box. Their power play's deadly," head coach Chuck Weber told mySA.com. At this point, Coach Pyle has said that many players are now just playing out the season for contracts and records. I think there should be more to it than that. Many in this group will be back next year, and they have a chance here to build for the future as a team. Wins now, while futile in the standings, can forge this group together further. When new talent comes in over the summer, Texas can build off their momentum they are gaining now to start the new season off right. With Clear Day in the rearview mirror, it's time for amateur tryout (ATO) contracts to start rolling out across the league. ATO signings in this timeframe are intended for players who have finished their collegiate or junior seasons and want to join the professional ranks. Last year's ATOs included Brenden Dillon, Stephen Schultz and Mike Embach, two of whom made significant impacts this year in Texas. First year ATOs included Tyler Ludwig and Cody Chupp. Texas can expect several players coming out of college to join the club in the coming month. Dallas management has pointed to five players joining Texas from the junior/collegiate ranks for next year. Several of them could get the jump with an ATO signing. The biggest one is Colgate Raiders forward Austin Smith. Smith, a Dallas native, is another fifth round gem from the Dallas organization. He is in the running for the Hobey Baker award (college hockey's Heisman) with 34 goals and 18 assists in 34 games. He has garnered similar praise as Matt Fraser in that "he just flat out scores goals." Colgate is currently in their league's playoff tournament. More information on Smith is available on the Colgate Raiders site. He was also profiled in Texas Monthly by friend of the blog, Jason Cohen. What is truly impressive about Smith is that he's more than an offensive powerhouse. Playing for Miami, one of the more physical teams in the nation, Smith has become a reliable two-way player who plays incredibly physical along the boards. He's a tremendous puck-mover in transition and while his shot is what will make him a star, he's quickly become one heck of an all-around hockey player. If Reilly goes pro, which is up for debate, he could join the Stars in the dying days of the season to get a little jump on systems and start to learn how to be a professional player. The college season has ended and the conference tournaments have begun. The NCAA selection show is March 18th and the tourney runs through April 7th. Austin Smith's Colgate Raiders are not currently ranked in the top 20 teams in the nation with a 17-14-3 record and don't look to be on their way to the dance. Reilly's Redhawks are ranked #11 and should make it. Austin, therefore, could join Texas as early as March 19th. From the junior ranks, Texas has two first round draft picks who will be joining them in 2012-13 and might make the jump earlier depending on their club's playoff fortunes. Jack Campbell, #10 pick in the 2010 selection draft, is the goaltender for the Sault Ste. Marie (Soo) Greyhounds. The World Junior hero's club is teetering on the edge of a playoff spot. The top eight team in the conference make the playoffs and the Soo are in ninth, two points back with six games left. If they miss, Campbell could join Texas as early as March 19th. From my perspective, statistics and game-to-game performances in the OHL isn’t the focus. All that matters to me is how much he learns, and how much he experiences during his time in juniors. I’d rather him face adversity, learn what it’s like to lose, what it takes to win, how to work harder than everyone else on the ice, and essentially, just mature as a goalie and a human being. More of that interview here. The other junior prospect is Jamieson Oleksiak, #14 pick in 2011, out of the Niagara IceDogs. The IceDogs also have six games left but are definitely making the playoffs as they are in first place in the Eastern Conference. Oleksiak has jumped up his offensive play recently with 13 points in his last 13 games and a plus-17 rating (stats help from DBD). He is a big body player at 6'7" and 252 pounds. He was selected for Team Canada's World Junior squad and is highly regarded by scouts as an agile and quick defenseman in addition to his size. He could go into the OHL and playoffs and, if victorious there, continue to the Memorial Cup. The high seeding of the IceDogs indicates that they are likely to advance into the playoffs beyond the end of Texas's regular season. As we've seen, Scott White works his scouting rather well to pick up ATO talent that rolls into AHL contracts the next season. We saw it with Cody Chupp the first year and Stephen Schultz the second. There has to be someone on White's radar that will join the club down the stretch. I would give you good odds on that player coming from Ferris State, if they weren't #2 in the country and destined for the tournament.